AR-15s Are Biblical 'Rod Of Iron' At Pennsylvania Church : The Two-Way The church in Newfoundland, Pa., was founded by the son of the late Korean Rev. Sun Myung Moon, but is an offshoot of the worldwide Unification movement. 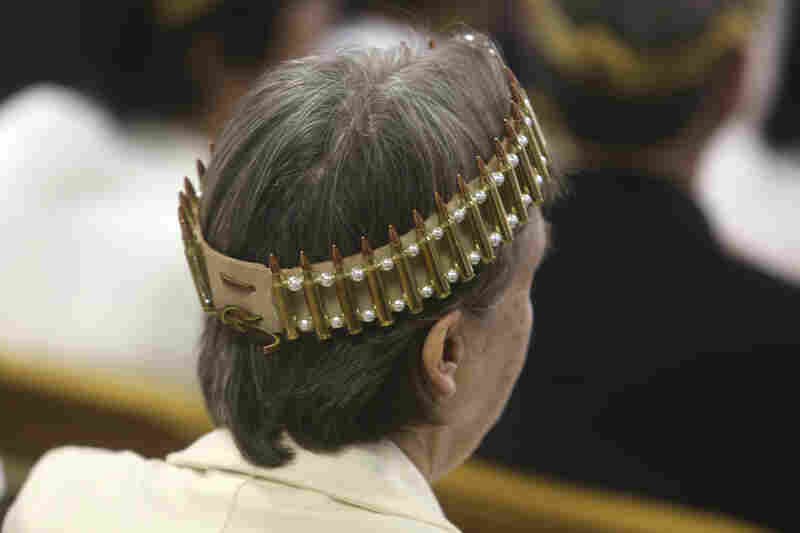 A woman wears a crown and holds an unloaded weapon during services at the World Peace and Unification Sanctuary on Wednesday in Newfoundland, Pa.
A woman wears a crown made of ammunition during services at the World Peace and Unification Sanctuary on Wednesday. 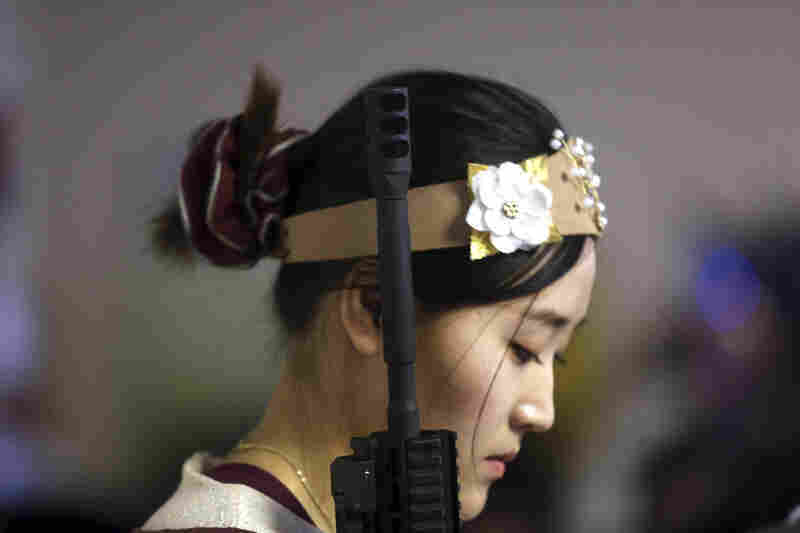 A sign directs people with guns during the ceremony, which reportedly attracted followers from as far away as Japan, South Korea and Europe. 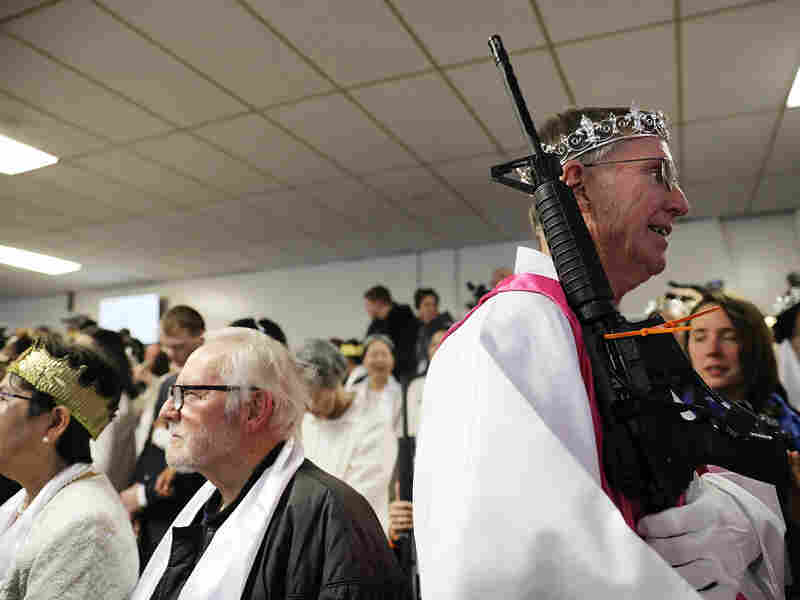 A church official holds an AR-15 rifle during the service. One attendee told reporters that she needed her weapon to defend her family against "sickos and evil psychopaths." A woman holds an unloaded weapon during the service. "We pray they would stand as kings and queens with their crown and rod of iron," the Rev. Hyung Jin "Sean" Moon said. 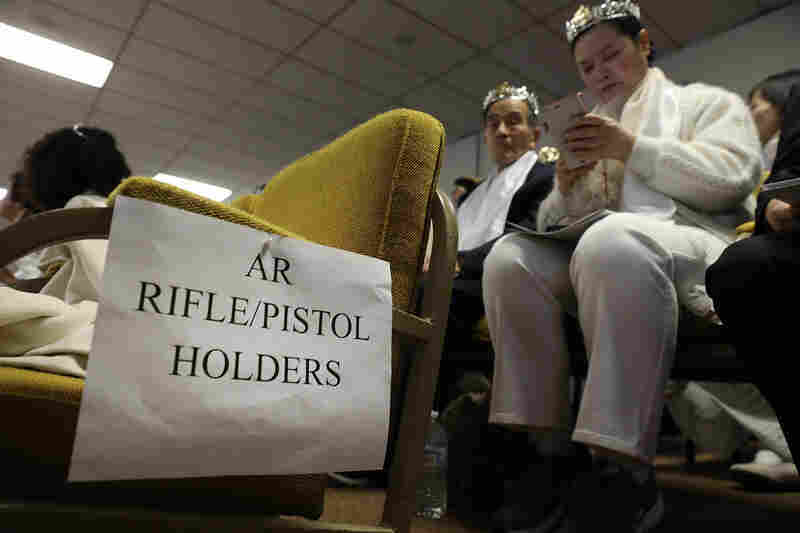 Hundreds of faithful at a Pennsylvania church on Wednesday carried AR-15-style rifles in adherence to their belief that a "rod of iron" mentioned in the Bible refers to the type of weapon that was used in last month's mass shooting in Parkland, Fla. 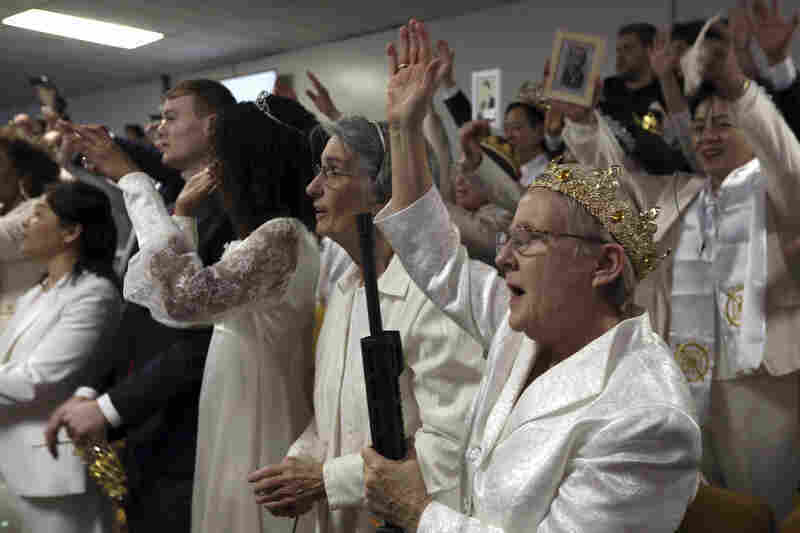 The armed ceremony at World Peace and Unification Sanctuary in Newfoundland, about 20 miles southeast of Scranton, featured gun-toting worshippers, some wearing crowns of bullets as they participated in communion and wedding ceremonies. Attendants carefully placed a zip tie into the receiver magazine well of each weapon to assure that a clip could not be loaded. Concern over Wednesday's gathering prompted a nearby elementary school to cancel classes for the day. It also sparked a small demonstration outside the church, with one protester telling The Associated Press that "it's scaring people in the community." According to The Philadelphia Inquirer, "The ceremony's official name was the Cosmic True Parents of Heaven, Earth and Humanity Cheon Il Guk Book of Life Registration Blessing. It was part of the church's weeklong 'Festival of Grace,' which included a 'President Trump Thank You Dinner' on Saturday." The Rev. Hyung Jin "Sean" Moon prayed for "a kingdom of peace police and peace militia where the citizens, through the right given to them by almighty God to keep and bear arms, will be able to protect one another and protect human flourishing." "We pray they would stand as kings and queens with their crown and rod of iron," he said. Moon is the youngest son of the late Rev. Sun Myung Moon — the self-proclaimed messiah who founded the Unification Church in South Korea in 1954 and eventually spawned a worldwide movement regarded by detractors as a cult. The church is perhaps best known for its mass wedding ceremonies. As the AP notes, "The younger Moon's congregation is a breakaway faction of the Unification Church, which had distanced itself from Wednesday's event." The ceremony reportedly attracted followers from as far away as Japan, South Korea and Europe. Within the past year, Moon incorporated the new belief about the AR-15 into the church's teaching. It is based on Revelation 2:27, which states, "he shall rule them with a rod of iron." One follower, Jonathan Franco, was quoted by Scranton's WNEP TV as saying, "If you don't have a rod of iron then, unfortunately, you can come into a situation where your life can come to an end. Who else is there to blame if you yourself didn't take the responsibility to preserve your own life?" Sreymom Ouk, 41, who attended the ceremony with her husband, Sort Ouk, and an AR-15, told the AP that she needed the weapon to defend her family against "sickos and evil psychopaths." "People have the right to bear arms, and in God's kingdom, you have to protect that," she said, according to the news agency. "You have to protect against evil." As the Inquirer notes, the Rev. Sean Moon's brother, Moon Kook-jin, also known as Justin Moon, is the founder and CEO of Kahr Arms, a firearms manufacturer headquartered in nearby Greeley. Kahr specializes in making compact semiautomatic pistols. It was not clear from its website whether the company sells AR-15-style rifles, but the newspaper quoted one follower who said he bought one there. "I actually purchased my weapon there yesterday because, although I have several rifles, I didn't have an AR-15," David Konn, who had driven from Florida earlier in the week, told the Inquirer.